Retrospect Professional 7 offers a wealth of features, but new wizards don't compensate for its overly complicated interface. I've been using Dantz's Retrospect backup software for years, and while I've always prized the app's wonderfully powerful backup capabilities, the program's interface has long been a stumbling block. I had high hopes when Dantz said Retrospect Professional 7 would be easier to use. Regrettably, the sweeping overhaul that I'd envisioned didn't materialize in the shipping version of the $129 program. Instead, I found a new set of wizards that step users through basic chores such as backing up, restoring data, and duplicating a partition. Though the wizards are nice, they don't make up for the application's continued use of arcane terminology such as "sets" and "volumes," or its odd workflow decisions such as splitting file selection into three nonconsecutive steps. Experienced users of Retrospect will be more interested in the new ability to launch backups using a single hot-key combination, or the predefined filters that let you easily skip backing up nonessential files such as MP3s. There's also more power under the hood: 128-bit Advanced Encryption Standard capabilities, support for WORM (Write-Once Read-Many) tape backup for government and industry data-preservation standards compliance, and the ability to archive to 8.5GB double-layer DVD+R discs. 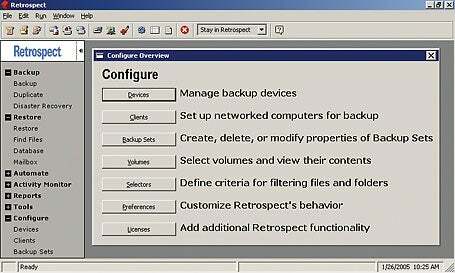 Retrospect Professional remains the cream of the crop in desktop backup software. If you're a newcomer to this application, sample the trial version before you purchase the pricey full version. As an existing user, I didn't find the new features worth the $45 upgrade fee. Before I spring for such an update, I want Dantz to make the program truly easier to use. Pricey, powerful backup program is slightly easier to use, but its interface still needs a tune-up.